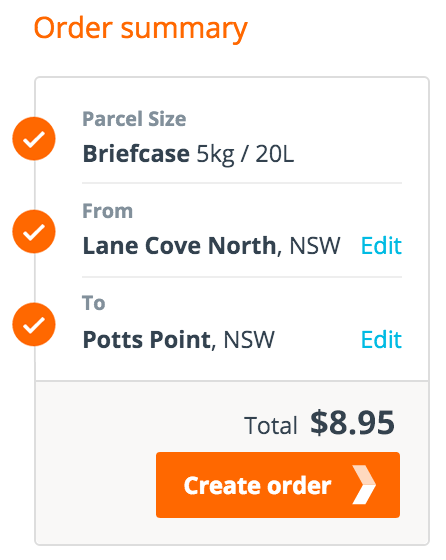 We started Sendle so that we could help Aussie businesses save time, save money and take control of their sending. We’re doing this by opening up door-to-door nationwide delivery with low flat-rates, active support, tracking and carbon-offsets to boot. The benefits of Sendle are real and immediate, so we’ve put together a guide that explains how you can send parcels like a professional. Put your toe in the water. When you log in to your dashboard you will see a welcome message. Save your address details and payment details to make booking speedy, or send right away, and we’ll remember your address. You never need to worry about making mistakes because you can always cancel orders before the pickup day – so feel free to make some test orders to get used to using your dashboard or just get a quote if you're curious. Where are we picking up from? For your first send, you will need to enter your pickup address and provide pickup instructions to help the driver find you or your parcel when they arrive to collect your parcel. We’ll save this information for future pickups, but you can always change it on-the-fly if you need to. How big is your parcel? After you’ve entered your pickup details you’ll continue on to the order page. Here you can select the size of your parcel, delivery information and choose your pickup day. If you are unsure about your parcel size you can use our handy calculator on the order page. Where is your parcel headed? The delivery information is an important one to get right – it’s where your parcel is headed! Clear instructions are the best way of preventing anything from getting in the way of a fast and easy delivery. Many of our customers give the driver Authority to Leave the parcel somewhere safe. We have low, flat-rate pricing across almost all of Australia. Once you’ve filled in the order details you’ll see the price appear on the right-hand side of your dashboard. Don’t worry, you haven’t paid anything yet and you can still change your mind and cancel the order at this stage. When do you want the pickup? The next step is to select your preferred pickup day. This is the day where we’ll send the pickup request to the driver's scanner with all the information you’ve provided. You can select up to three days ahead. You’ll now see a summary of your order in the top right corner of your dashboard. If you’re happy to proceed just click “create order” and Sendle will book the highest-quality provider for your route, provide you with a label and schedule your pickup. In the rare case that you have any technical difficulties at this stage please read our troubleshooting guide as you may be using an unsupported browser configuration. Wrap it like you love it. Now it’s time to safely package your parcel, print out your label and attach it to the parcel so the driver can identify the parcel and so that we can track the parcel each step along its journey. On the pickup day, the driver will add your pickup to their route for that day. The driver picks up all their parcels and then takes them back to their depot for sorting and delivery. We've got your back in the rare instance that a parcel is not picked up - we'll automatically rebook it for you and chase the provider on your behalf. Remember: We also have a Pickup Guarantee promise as well for extra peace of mind. Once the parcel is picked up you’ll receive a delivery estimate for your parcel and we’ll send an email to let the receiver know that the parcel is on its way. Both you and the receiver can track each step of the journey from your dashboard - it’s the 24/7 place to go to see how your parcel is travelling. Once the parcel makes it to its destination the delivery driver will follow the instructions on the parcel to complete the delivery. If they cannot get it delivered on the first try they will leave a card to organise a redelivery or they’ll take it somewhere nearby (such as a news agency) for the receiver to collect at their convenience. If your parcel is not delivered within the estimated delivery timeframe, don't worry we're here to help. When the parcel is scanned as delivered you will receive a notification by email and you can rate your pickup experience and the receiver can rate their delivery experience. These ratings help us to make the service better by helping us choose the top-rated providers for every route and use it to help us make the Sendle service a little better every time. If you need help once your parcel has been picked up you can go to the help tab on your dashboard. Our help centre is full of useful articles and our support team – powered by real people, a happy, helpful bunch – will be there to answer your questions. You’re able to see all your deliveries in your dashboard. You can send another to the same address simply by clicking the resend button, we remember your previous addresses for future orders. So the more you use Sendle, the faster it gets! Now that you know how Sendle works you can head over to your dashboard or check out more of our helpful articles.